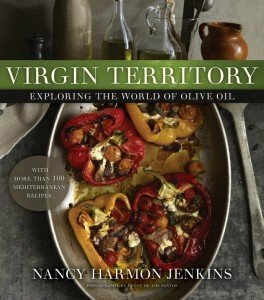 It’s the simplest, most basic of foods, the one cooks turn to when there’s nothing to eat in the house—because there’s almost always an egg or two in the pantry, ready to be scrambled for a quick supper, or tossed with hot pasta to make a rich carbonara, or poached in chicken stock to turn unassuming broth into chicken soup. Spring and eggs go together. 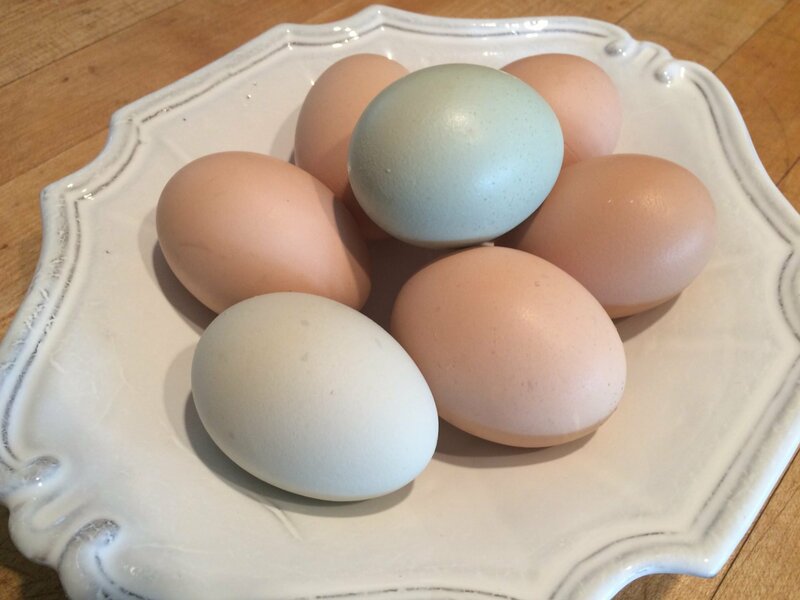 When the light starts to strengthen and the grass begins to green, the hens begin to lay once more, which is why eggs are so closely tied to the two great Mediterranean spring festivals, Easter and Passover. The egg on the Seder plate, the colored eggs in the Easter basket, are there to announce that winter is over and new life has begun. Fortunately, eggs have crept out from under the dishonor in which they were held for decades, vilified for high cholesterol content and banned from the tables of anyone who feared heart disease. No longer! Dietary cholesterol is not usually the cause of elevated serum or blood cholesterol. That’s more the result of a diet high in saturated fat, or of unhappy luck of the genes. Eggs, traditional kitchen folklore tells us, are good for you, an excellent source of protein of course, low in total fat, with 0 carbs and just 71 calories in a normal large egg. They are good sources of iron, selenium, phosphorus, and riboflavin, as well as vitamin B12. They’re also well supplied with antioxidants lutein and zeaxanthin which protect against macular degeneration, among other benefits. Did your mother tell you eggs are good for your eyes? Mine did, and she was right! But what kind of eggs? Cage-free, free-range, pastured, pasteurized, organic? The choice is confusing but for most and best flavor, my vote goes to eggs bought from the farmer who tends the chickens. Like Farmer Hubert’s eggs, pictured above, they may be multi-colored (the blue ones are from Araucana hens, the white ones from Leghorns, but I can’t tell you about the rest.) Going straight to the source, you’ll find out how the chickens were raised, what they’ve been fed, and how fresh the eggs are. A bonus: eggs from hens allowed to scratch around a chicken yard are almost always better tasting than ones raised in total captivity. 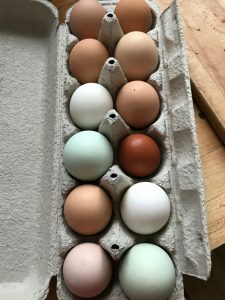 Incidentally, brown eggs are favored in New England and white eggs preferred elsewhere, but the flavor and goodness are exactly the same. What about salmonella? If you think eggs are risky, cook them thoroughly, either hard-boiling or baking in cakes or cookies. Hard cooked eggs can quickly become deviled eggs, a seriously delicious, old-fashioned treat. Do them up Mediterranean style, mixing yolks with a little mustard, some capers and a few green olives chopped with fresh green herbs, the whole bound with a dab of olive oil and another dab of mayonnaise. Or serve them plain, halved and garnished with a black- or green-olive tapénade. 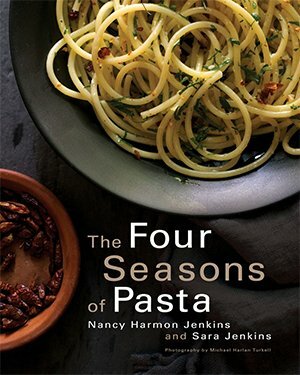 Take a tip from the Italian kitchen and drop eggs, one after the other, into a bean-and-pasta soup, then serve a poached egg with each soup portion, perhaps with a little parmigiano reggiano sprinkled on top. Another dazzling egg trick I learned from Maria Jose San Roman, a great chef from Alicante in southeast Spain: Use gently fried eggs as a sauce to top sautéed potatoes: Sauté sliced potatoes (in olive oil, of course), then arrange on a platter, season generously, and top with eggs similarly fried, the yolks basted with hot oil so that when they break they make a rich, golden sauce for the potatoes. Nothing could be simpler—or better. 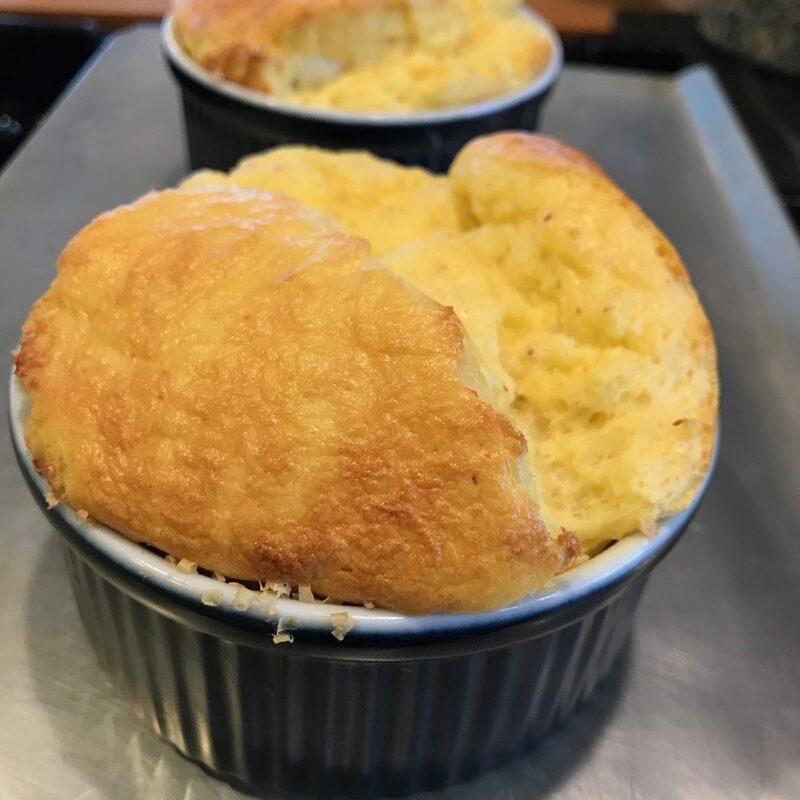 Cheese soufflés transport eggs to the height of elegance. They have a reputation for being tricky but they’re actually easy when you understand the concept. 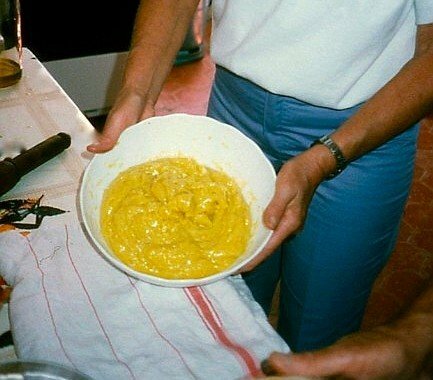 Basically, it’s a béchamel sauce into which egg yolks are stirred and then the stiffly beaten whites and grated cheese, baked until the eggs puff up, and then served immediately. Wait just 10 minutes and the soufflé will deflate–still tasty but not the exciting thing that comes straight from the oven bursting with cheesy fragrance. Another advantage: You can prepare most of it ahead of time, then just beat up the egg whites and fold them in with the cheese right before you put the thing in the oven for 20 minutes. Most soufflé recipes make enough for 6 people but I like this snug little way of making just enough for two. You’ll need: butter, a small amount of freshly grated parmigiano reggiano, a little all-purpose flour, about 3/4 cup of whole milk, 2 eggs (separated), and a cup of grated cheese (gruyere is best but emmenthal or cheddar will work well too). Plus the usual salt, pepper and, if you wish, a pinch of ground red chili and/or a spoonful of French mustard. First butter the inside of a couple of small soufflé dishes, the kind that hold about 1 cup. Butter them generously and sprinkle the bottoms and sides with grated parmigiano–you’ll need about a tablespoon for each. Set these aside and in a small saucepan melt about a tablespoon of butter over low heat. While you’re doing this, warm the milk in a separate saucepan–it should be very warm but not simmering. Whisk about 1 1/2 tablespoons of flour into the melted butter, whisking well to avoid lumps. Cook, stirring, for just a minute or two to get rid of the raw taste of the flour, then start adding the hot milk, a little at a time and whisking after each addition. This will avoid lumps in the béchamel sauce. When all the milk has been added, continue cooking for a bit to let the sauce thicken to the consistency of very heavy cream. Remove the pan from the heat and let it cool down a bit, then add the egg yolks, one at a time and whisking well after each one. Add a little salt (not too much because the cheese will be salty), ground black pepper, a pinch of chili pepper if you wish (I like to use piment d’Espelette, the chili from the Basque country of southern France), and a spoonful of Dijon mustard. Stir all this together then set aside until you’re ready to continue making the soufflés. When you’re set to continue, heat the oven up to 450º. Beat the egg whites to a stiff froth, then gently stir half the egg whites and half the grated gruyere into the béchamel. Top with the remaining egg whites and cheese and, using a spatula, fold it all together. Add the mix to the two soufflé dishes and transfer to the hot oven, immediately turning the heat down to 350º. Bake for about 20 minutes or until the soufflés have risen and turned golden on top. Remove and serve immediately. 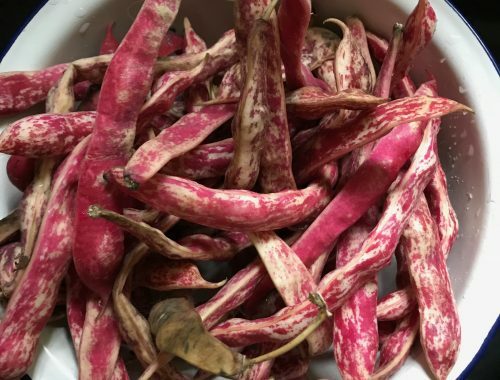 Shucky beans for a late summer lunch?